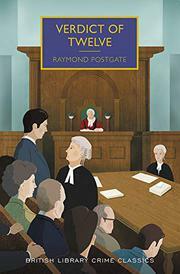 This reprint of Postgate’s celebrated 1940 debut, which examines the impact of individual jury members’ lives and opinions on the outcome of a murder case, is the first entry in Poisoned Pen’s British Library Crime Classics to actually live up to the series title. Rosalie van Beer stands accused of poisoning her nephew, 11-year-old Philip Arkwright, with some wicked stuff called hederin found in the ivy dust she allegedly sprinkled on his lunch. The case is compelling: Rosalie had never liked the boy; her own position in the Arkwright family, which she’d married into and been widowed from, had always been marginal; the mutual dislike festering between Philip and her had been dramatically escalated by her execution of his beloved pet rabbit; and his death will bring her a fortune. But Elizabeth and James Rodd, her housekeeper and gardener, would also benefit financially from Philip’s death, though on a much smaller scale, and Sir Isambard Burns, her counsel, has learned some information he’s convinced will be the basis for an effective defense. So far, so routine, though Postgate writes with a memorably acrid wit. The innovation here is a long opening section providing detailed portraits of the 12 jurors who’ll decide the case, each of them with their own prejudices, quirks, and variously relevant back stories. Once they’ve heard the evidence and retired to the jury room to consider it, the actor among them considers the performances of the attorneys, the Oxford don wonders why he isn’t the foreman, the Greek immigrant who is the foreman does his best to conduct everything as Englishly as possible, and the religious fundamentalist seeks divine guidance he can foist on the others. The results of Postgate’s probing eye, by turns psychological and sociological, are richly and rewardingly ironic, right down to the indelibly understated final speech. A classic reprint you can’t afford to miss.